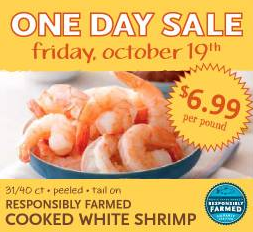 Here’s a reminder that today, 10/19, Whole Foods has their Responsiblly Farmed Cooked White Shrimp for $6.99 lb. This is available while supplies last and the stores won’t be offering rain checks, so grab some early if you want it! If you are headed out, check the current Whole Foods deals too.